As the freshness of autumn turns into the chill of winter, it is time to dig out the winter woollies and the Ugg boots. Fittingly, this Friday kicks off ‘Wool Week’ (10-17 June). We are thrilled that Mary-Annette Hay, the subject of Te Papa’s 2007 exhibition Queen of Wool and whose elegant all-wool wardrobe is in our collection, has been invited to be the campaign’s Honorary Ambassador. Wool Week is an initiative of The Campaign for Wool, ‘a global five-year campaign to get people once again talking about the wonderful properties of wool’ that is now taking off in New Zealand. The Campaign for Wool was initiated last year in the UK by His Royal Highness the Prince of Wales, who had observed that the wool industry was facing enormous and unprecedented challenges. ‘The Campaign is multi-national, multi-sector and inclusive, and tries to embrace all sections of wool users from the very largest companies to specialist artisans’. In New Zealand Wool Week is being launched with ‘Lambs on Lambton’, which features a live shearing demonstration on Lambton Quay, and later on this evening a fashion show during which 12 designers will showcase their interpretation of New Zealand’s iconic black woollen singlet. Zambesi, Nom*d and State of Grace are among the line-up. It is perhaps both ironic and fitting, that Wool Week kicks off following the news of the death of New Zealand’s most famous sheep, the rebellious merino, Shrek. Fine woollen garments by El Jay and Christian Dior by El Jay from Te Papa’s Collection. Wool is also getting its own showcase at Te Papa in the forthcoming exhibition New Zealand in Vogue, which opens 24 June in the Eyelights Gallery. Each case in the exhibition is inspired by a headline from Vogue New Zealand, including The Way to Look in Wool. The Way to Look in Wool focuses on the importance of the New Zealand Wool Board Awards to fashion in the 1960s – a time when the Wool Board saw itself as waging a war against new-fangled synthetics, such as Crimplene. 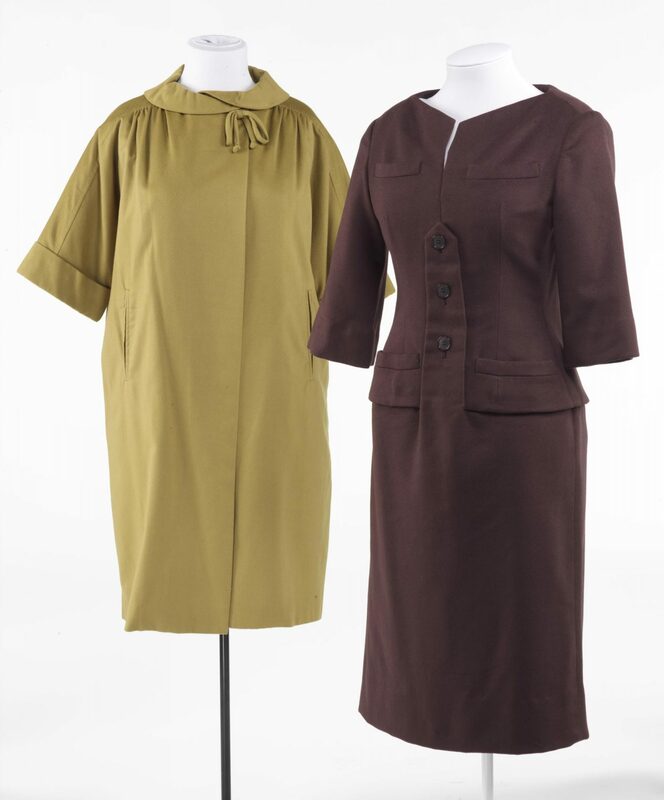 The case includes garments by El Jay, Christian Dior by El Jay and Fashionbilt, and is supported by film footage from the 1965 Wool Awards starring Miss World, Ann Sidney. Just as the garments and the themes for each case have been directly inspired by the pages of New Zealand Vogue, so has the exhibition’s design which was conceived by Ben Barraud. Overall Ben was influenced by ‘the grid’ which underpins all of the magazine’s design. 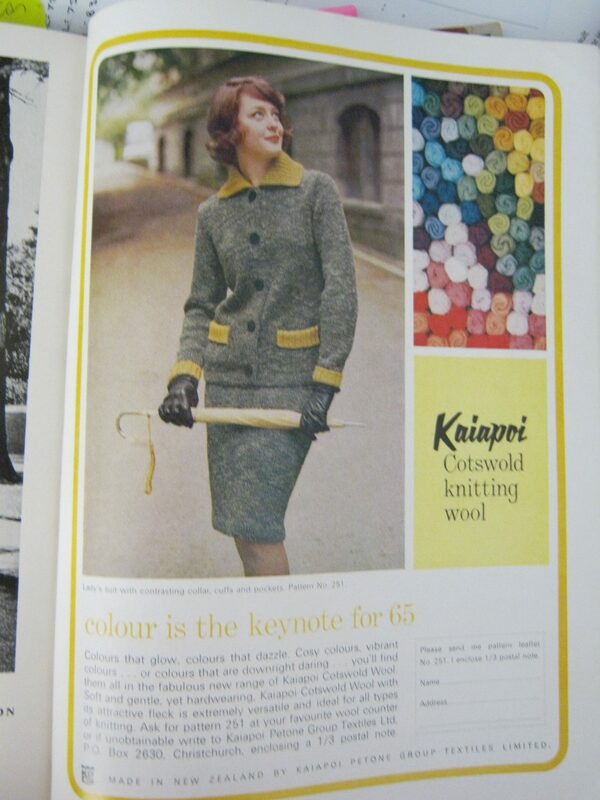 For The Look of Wool Ben took inspiration directly from this beautiful advertisement for Kaiapoi knitting wool. Kaiapoi Wool advertistement from Vogue New Zealand. I got to spend a happy hour at a local knitting store chosing a suitable palette of knitting balls to recreate the look in the display. During the exhibition’s installation (19-23 June), I will publish a post on the design, the pages that inspired and its realisation in the space. Fashion and wool will be a major theme explored on the evening of Thursday 21 July at 6.30pm when I will be joined in conversation by Michal McKay, former editor of Vogue New Zealand, and Jillian Ewart, who followed in Mary-Annette Hay’s well heeled shoes as fashion promoter for the NZ Wool Board in the 1960s. In 1967 Jillian got to host Pierre Cardin on his visit to Auckland, when he touched down with a futuristic collection of woollen garments which both wowed and puzzled the critics. Keep an eye out on our events calender for more details. In closing, I will leave you with a message from the Wool Board of the 1960s, who certainly knew how to imbue wool with a bit of allure. Have a great weekend, keep warm, and maybe even raise a toast to that old woolly rogue, Shrek.